Looking for a healthy & hearty sandwich recipe? 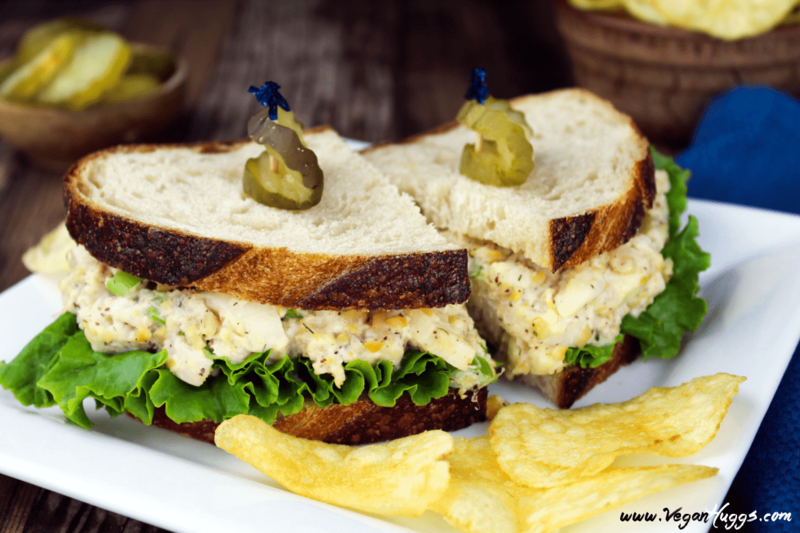 This Vegan Tuna Salad Sandwich is satisfying, nutritious and out-of-this-world delicious! It’s back-to-school time for most kiddos and that means, back to making to-go lunches. 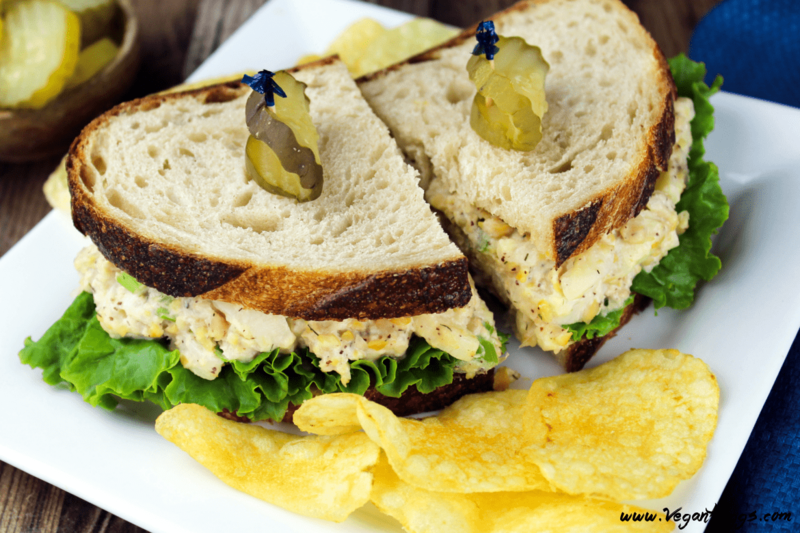 So today, I’m going to share my son’s new favorite lunch…a Vegan Tuna Salad Sandwich. It’s always a difficult task to prepare fresh food that sits for hours before being eaten. It’s even harder if you have a picky kid. My son was always a good eater until he started preschool. Everything is “gross” now. He still likes to eat…he’s just more fussy about textures. He won’t even touch some of his favorite foods anymore and we have to keep changing things up (I have to pick my battles wisely). I get him to eat beans by telling him, that they are magical and not to tell anyone. Of course, he eats them and tells everyone about it. Works like a charm! I recently made him one of my favorite mock versions (there are many), of the classic tuna salad sandwich and he loved it. Boy, was I happy about this! I’m not sure how long it will last, but I’m enjoying it now. 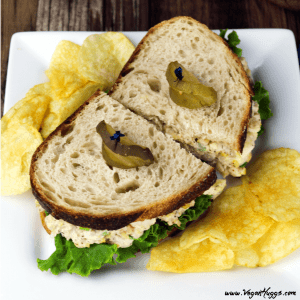 This Vegan Tuna Salad Sandwich is creamy, tangy & delicious! Besides the tasty part, it’s protein-packed and nutritious. I’ve been packing this is my son’s lunch and he comes home with an empty lunchbox and a happy belly. My mom always packed my lunch growing up and I really loved it. There were a few times though, that she packed me a tuna sandwich and although it was delicious, and my favorite sandwich to eat (besides PB&J), it made quite an offensive odor at lunchtime and the other kids let me know it (the same “gross” thing). That wasn’t so much fun, so we reserved them for home enjoyment after that. I haven’t eaten tuna in many years though. Even before going vegan, I stopped eating it when I learned of the high mercury levels in the fish. However, I did miss that classic creamy & tangy sandwich and after going vegan, I was able to enjoy this mock version of it. It’s not missing a thing, except mercury & that fishy smell. 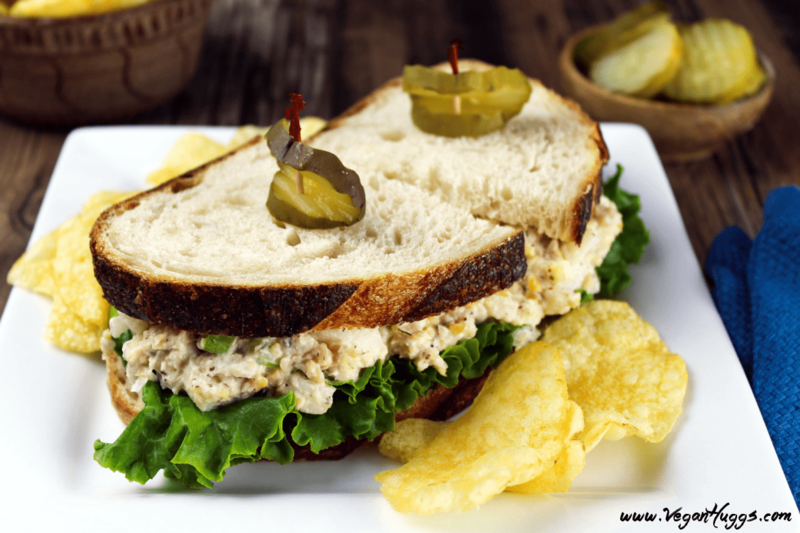 I love this Vegan Tuna Salad Sandwich because it brings me back in time and it’s not hurting my health or my sea-friends. I use Hearts of Palm, which have a very similar texture to fish when it’s broken up. It doesn’t taste like tuna, but that’s where the seasonings come in, to create a subtle sea-like flavor. I also used Garbanzo Beans (a.k.a chickpeas), which have a flaky-like texture when broken up. They also add a nice dose of protein to the recipe. So, basically, these two ingredients will be replacing the tuna and creating that flaky, tuna-like texture. I use kelp or dulse flakes to give this vegan tuna salad a subtle hint of the ocean. It’s not needed but adds a nice flavor and natural source of iodine to the recipe (nori can also be used). This Vegan Tuna salad Sandwich is so easy to make and can be ready in less than 20 minutes. It yields about 3-4 sandwiches and it can be stored in the fridge for 3-4 days. So, it’s perfect for making ahead and saving time. This vegan tuna recipe is on the kid-friendly side, so feel free to add some diced red onions, bell pepper, olives or pepperoncini to the mix. This mixture can be enjoyed as a healthy snack too, with some crackers or veggie sticks for dipping. To make this sandwich even healthier, you can choose a gluten-free bread or even a sprouted whole grain variety. The Ezekiel brand is one of my favorites. If you’re not much into sandwiches but would like to make a vegan seafood recipe, you should try these Vegan Crab Cakes I made a few weeks ago. The ingredients are similar and will offer similar textures and flavors. So, are you ready to try this plant-powered lunchtime favorite? Let’s do this! In a food processor add the garbanzo beans and hearts of palm together. Pulse just a few times to shred it up. Don't pulse too many times or it will turn to mush. It should have a tuna-like consistency. You can also do this by manually, just use a fork or your hands to shred everything up. In a large mixing bowl, combine mayo, dulce or kelp, garlic powder, dill, salt and pepper. Add garbanzo bean/hearts of palm mixture, celery and combine well. Line a slice of bread with lettuce and spread "tuna" mixture on the other slice. Close the sandwich together and cut diagonal. Use a toothpick to secure each half and add pickles, if preferred. Repeat with the additional sandwiches. Serve with some chips and enjoy! *This recipe will yield about 3-4 sandwiches. *Sandwich add-on ideas: tomatoes, pickles, sliced red onion, olives or pepperoncini. *If you can't find kelp or dulce flakes/granules, you can use any type of seaweed. You can even break up a sheet of nori. If you prefer to skip the subtle seaweed flavor, you can add a 1/2 teaspoon of Old Bay Seasoning. If you make this recipe, I’d love to hear from you. Leave a comment below and let me know what you think. It would really make my day. You can also follow me on Instagram and share your creation with me, Just tag me @veganhuggs and hashtag #veganhuggs. so glad to have found this recipe awhile back. i make it fairly often and it rules!!! Since I don’t happen to have hearts of palm on hand,I will be using canned jackfruit. It’s also similar in texture to tuna,so I’m pretty sure it will work with the beans. Looking forward to making a batch of this treat. This is amazing! I’m a notorious carnivore, but something about this recipe piqued my interest. I tried it over the weekend, and it’s truly fantastic! Tuna melts are a staple of mine, and I’m 100% honest when I say I might never go back to real tuna now. This is just as tasty, healthier, and cheaper! Since it’s really hot here in TX this summer, last weekend I was looking for things to make so I wouldn’t have to turn on the oven. This was a great recipe and really yummy. I’ll be adding to my regular recipe rotation. Also can’t wait to try the “crab” cakes! You’re right, hearts of palm really does have that texture. Mostly I just want to say thanks. 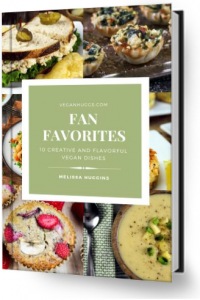 I’m newly vegan (a process that took about a year to convert) and having these recipes makes my life so much easier and interesting in the food department!! This looks so good! I will be trying it for sure. I just hope when I go to the store, they still have the Hearts of Palm. It seems when I don’t need something, it’s there and when I do need it, it’s sold out. Lol. I’ve been craving tuna since I switched over, so I can’t wait to try it. I looked critically at a bunch of recipes in an effort to get close to a sandwich I ate in LA last month that ruled. This looks like exactly what i’m searching for and will make in a couple days (and probably take to school for lunch on the regular!). Thx! Hi there, thank you for stopping by. I hope you give it a try, and I’d love to hear your thoughts. Have a great week! This is absolutely the best vegan tuna salad ever! I didn’t have dulce flakes so I used Old Bay. It’s a keeper! Thank you! I recommend Creamy Original Chao Slices but they’re admittedly on the mild side for this sandwich. Thanks for writing. I’ll be back to try out other recipes. OK. Made it on a melt – on rye bread with Fieldroast slices, red onion and banana peppers. Very very good. Thanks for helping a newbie vegan! Hi, Melissa, Can I use it on a mock tuna melt? On rye with a vegan cheese. I will be skipping the nori or kelp. Can’t wait to try it. Thanks for sharing! Genius! I’ve done a chickpea “tuna” salad, and I’ve done a hearts of palm “crab” salad…but never thought to use the hearts of palm for this!! It’s perfect! I chopped the hearts of palm up into a more “flaky” instead of shredded texture, but either way it’d be delicious. Thank you!